An avocado is the perfect substitute for a taco shell! Not only can you enjoy the taco toppings, but you get to enjoy the avocado and can even scoop some out for a little guacamole! This is such an easy dish to make. All that’s needed is to slice the avocado in half, remove the pit, use a spoon to scoop out a little of the avocado to create a larger crater. And make sure you save the avocado to make some guacamole! 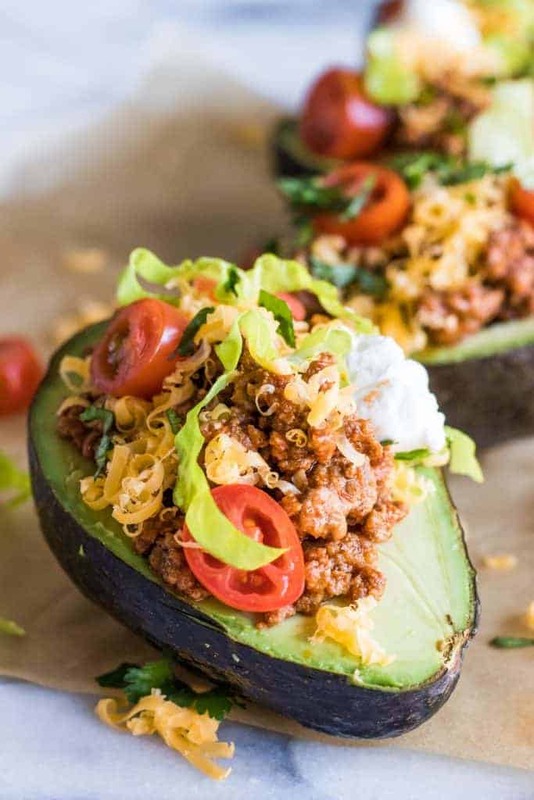 Then just load up the avocado halves with your taco toppings of choice! Although I recommend following the recipe below for the BEST taco meat made with a homemade taco seasoning. 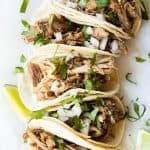 Or you can use these recipes for some Slow cooker sweet barbacoa, Mexican brisket, or carnitas to stuff the avocados with also. 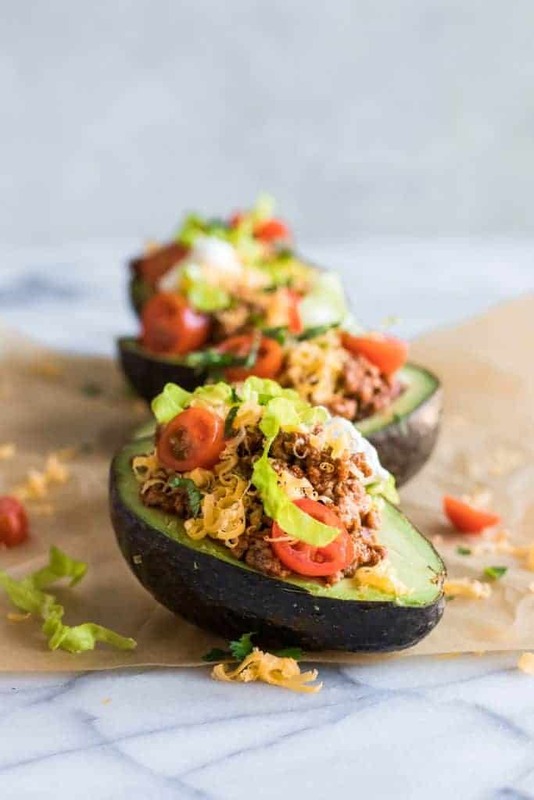 These taco stuffed avocados are perfect as a lunch or a light dinner. Low carb friendly. And the best part? My kids loved them! 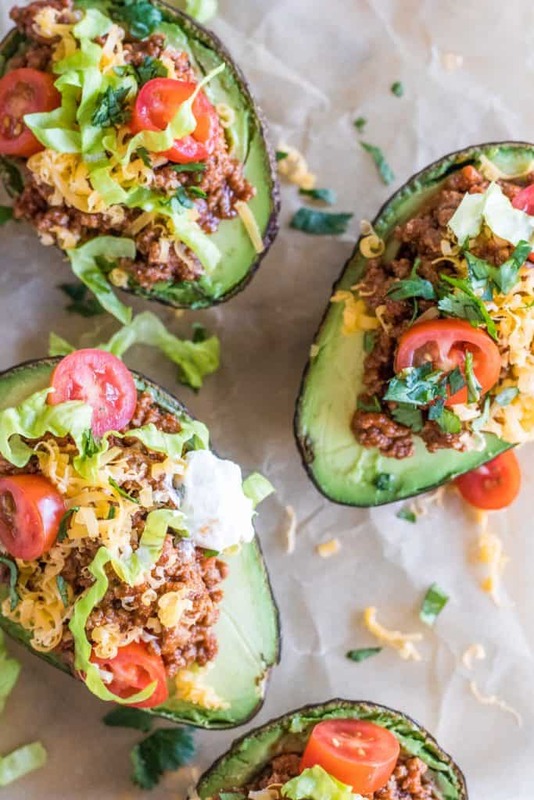 How Many Carbs Are In These Taco Stuffed Avocados? 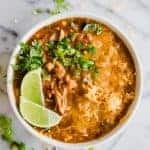 When looking at the carbs that are included in this recipe we need to keep in mind that we need to consider NET CARBS. Meaning we take the total amount of carbs in the avocado and subtract the fiber. Which leaves us with 3 g net carbs. Never miss a recipe! Follow me on Pinterest! Looks delicious. How many grams of fat per serving? Thanks! Myfitnesspal shows 21 grams of fat. Most of which is the fats from the avocado. Avocados are GOOD fats…..they help to burn the fat on your body. There’s 21 gm of carbs? I just put the recipes into myfitnesspal.com and use the information that they provide. Looking up the ingredients separately though I’m fairly sure that it’s lower since it looks like 1 avocado is only 14 g and the serving size is for 1/2 of an avocado. So how is that low carb? That’s about 2/3 of my daily allowance. But never mind. These look awesome. After some more research on avocados (again, I’m not a low carb food blogger, I’m just a huge taco fan!) these would be the carbs, but this is different than the NET carbs. To get that we need to subtract the fiber from the avocados. Which means the NET carbs would be about 3 g.
Is the serving size a whole avocado or half? The serving size is set for half an avocado. I just put the recipes into myfitnesspal.com and use the information that they provide. Looking up the ingredients separately though I’m fairly sure that it’s lower since it looks like 1 avocado is only 14 g and the serving size is for 1/2 of an avocado. Isn’t 21 carbs kind of high for 1/2 of a stuffed avacado? I believe it is! I just put the recipes into myfitnesspal.com and use the information that they provide. Looking up the ingredients separately though I’m fairly sure that it’s lower since it looks like 1 avocado is only 14 g and the serving size is for 1/2 of an avocado. This is going on my family’s low-carb menu ASAP!!! There are many different types of carbs and it can be hard to decipher…. Hi Toni! I leave the skin on the avocado and use it kind of as a bowl. I eat it with a spoon or fork and just scoop some of the avocado with each bite of the filling. Enjoy! Never thought of doing this. Will substitute ground turkey, looking forward to trying this. Thanks. Can you freeze the leftovers??? Also do you have a recipe for guacamole?? Sounds wonderful…however someone should learn how to spell avocado! Haha. You win for being the first to point that out! Got it fixed 🙂 Thanks. Genius! Thanks for sharing. So versatile too. 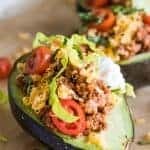 These look amazing and perfect for a low carb lifestyle since net carbs in an avocado are super low. High nutrition, low carb and all in a taco, thanks for sharing. Clean fats and fiber. I love this idea!! 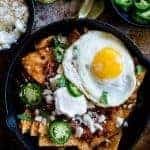 I am new to keto, and there is no way I could stick to it if I had to give up tacos! Theses are great and super easy! Hey Serene, can you clarify – is this recipe 3 net carbs per serving? Thanks! I loved this! I used taco seasoning and water instead of tomato sauce. I served this with rice and beans for dinner, we love carbs! 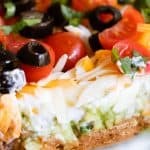 Great recipe, avocados are the best! My husband an I are on the Keto diet. We had these for lunch today and they were so good! Definitely will be having them again…many ties.